Super Mario Galaxy is officially out. With any luck, I’ll be the first person on Videolamer to discuss it, though I am probably the only one who doesn’t yet have it (though you are all welcome to buy it for me during my almost ended state of unemployment). That’s okay however, because I’m not really here to discuss the game proper, but the buzz surrounding it. Simply put, this is being called a return to form for Mario, a game that is the rightful successor to Mario 64. This sounds eerily similar to the remarks made about Twilight Princess, which fits the mold created by Ocarina of Time better than any other Zelda to succeed it, even Majora’s Mask. For most people’s money, these are the top two games on the Wii, Metroid Prime notwithstanding. Suffice to say that I find this a bit alarming. It isn’t that I insist on believing Mario Galaxy is a bad game; my mind is practically set already that it’s a good game. But the opinions about Nintendo’s first party efforts on the Wii, be it from the Nintendo faithful or the mass market, show just how much appearances can affect us, and just how mixed up our assessments of Nintendo games have become. Nostalgia is getting to us, and we need to do something about it. The camera complaints are quite valid; while I don’t recall having serious issues with it, it most definitely tried to mimic the one found in Mario 64, which opted for precision over intuitiveness. The reason it is interesting is that, well, no one seems to remember just how troublesome the camera controls were in Mario 64 (at least until you got used to them). The only explanation is that the game’s modern status as a golden boy means that we can selectively forget about all its bad parts. Nostlagia has gotten the best of us. The other issues can be summed up like this: it wasn’t the concept of the FLUDD pack that was bad. The problem, I think, was that FLUDD and the concept of cleaning did not mesh well with traditional Mario platforming. As Jay discussed recently, it isn’t that Mario doesn’t work in this situation, they just need him to adapt to something new. 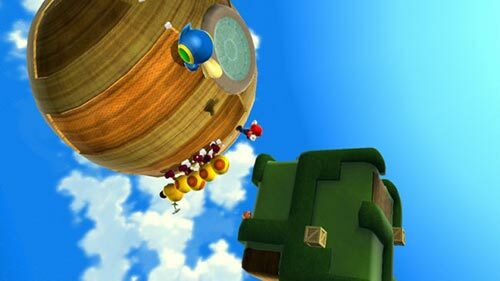 Nintendo, however, needed a traditional Mario game on their new console, and so FLUDD was shoehorned in. If they had eliminated some of Mario’s moves, and focused more on using the abilities inherent in a jetpack to help him navigate, we could have had a very interesting spin on traditional platforming. Sunshine is a case of new ideas being held back by tradition and familiarity. On the other hand, point number 2 on the list is an example of what happens when you break tradition. It isn’t that Sunshine it too kiddy. If that were the case then no one would be playing Mario Galaxy, which looks just as saccharine sweet. The real problem (that few wanted to voice) was that Delfino Island did not feel as large and daunting as Peach’s Castle did in Mario 64. Not only that, but the idea of a tropical resort as your sole location means that most levels are going to feel very similar, and this is certainly the case with Sunshine. 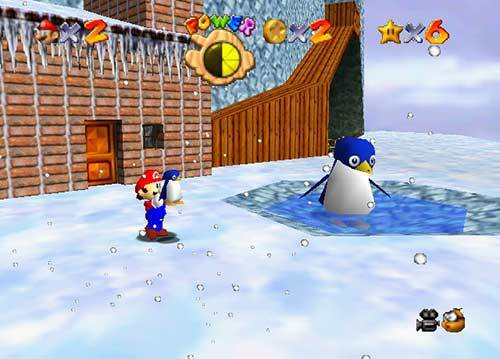 To sum it up (for now at least), Mario Sunshine was both too bold for its purposes, and yet not bold enough. Ultimately it is likely worse than both 64 and Galaxy, but I think it deserves much more respect than it is given. The case with Zelda is a little harder to decipher. 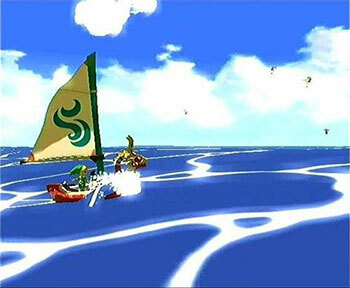 Wind Waker’s two major issues were its use of an ocean as the overworld, and its use of cel shaded graphics. Thanks to these two choices, Wind Waker was practically down before it even had a chance to fight. This is a damn shame, because while Sunshine may be no more than a “very good” game, Wind Waker was fantastic. I have said time and again how lovely the graphics look in motion. Beyond that, the game has a whole lot of life in it. The characters convey a great deal of emotion just through their facial expressions, and many areas are packed with clever secrets to discover. Furthermore, for all the time wasted by the sailing mechanic, it allows for a whole sea of secret islands to explore. This level of actual exploration is something I associate with Zelda games, and it was done to good effect. Here is where things get a bit controversial. While I’m willing to believe that Galaxy is a better game than Sunshine, I am certain in my mind that Wind Waker is a better game than Twilight Princess. Many would disagree, and I’m not sure why. Wind Waker was a refreshing take on Zelda, something that tried to breathe at least a little life into the aging formula. 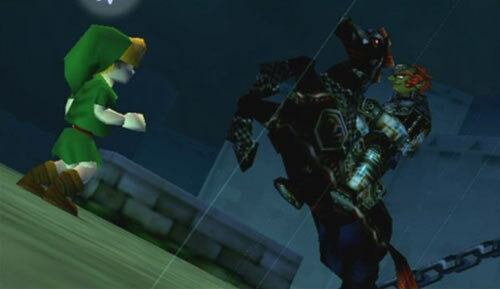 Twilight Princess feels like Ocarina of Time multiplied by 1.5. We’ve already done Hyrule Field. We’ve done horseback riding. We’ve explored Hyrule Town. Everything about TP feels like it should be bigger and more epic than it actually is. Ocarina of Time’s battle with Ganon was amazing. Wind Waker’s was shockingly good. 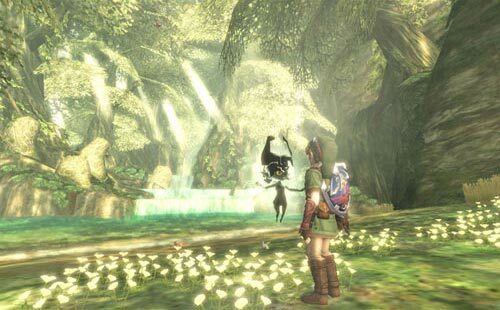 Twilight Princess wanted us to feel overwhelmed with its final duel, but it’s hard to feel that way when you’re fighting a giant pig, followed by a sword fight that is hard to lose. Wind Waker’s gang of pirates had more personality in them than the entirety of Twilight Princess’ Kakariko Village. How many different times did they think they could make the children say “Link, you’re awesome” and make me feel good about it? Twilight Princess felt mechanical and work-like, with little reward throughout. Considering how closely Wind Waker followed the traditional Zelda formula of “this new item will rarely be used outside of its dungeon”, that is saying a lot. Again, most people won’t feel that strongly about Twilight Princess, but the point is clear; our opinions on Nintendo’s games seem weighted by nostalgia more than anything. If you still need proof, just ask yourself if you watched the clips of Mario Galaxy that featured airships and classic Mario music and got excited over it. For various reasons, we don’t want these games to go against tradition. 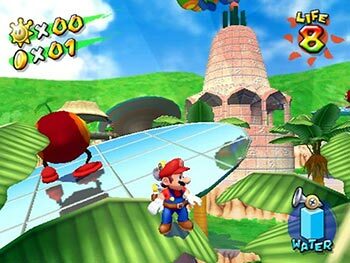 If Mario Sunshine expanded on the FLUDD concept and became a very different (but even better game), I hardly feel it would have been given any more praise, as it would have gone even more against the grain. This is troubling to me for two reasons. Firstly, it goes against what so many people complain about, that Nintendo continues to make the same games time after time, a point that others continually refute by citing many examples of Nintendo innovation. I am starting to realize the problem: Nintendo is innovative, but their innovations are frequently one piece in an otherwise standard formula that we have played far too many times. Notice how Nintendo’s most talked about innovation of recent years is Pikmin, a title with a brand new concept and characters. Maybe Mario does matter when it comes to Nintendo games. When he’s in some sort of spinoff, he can do whatever he wants, but anything involving running and jumping can’t fall too far from the tree. I guarantee you that Link’s Crossbow Training will never earn more than a 6/10 from any reviewer, since it will only earn three of those deducted points if it involves fighting Gannon, saving Zelda, and collecting pieces of the Triforce. The elusive fourth point could only be earned if Link uses his crossbow to find three useless treasures at the start of the game before things actually get interesting. Second, Nintendo is giving fans too much power. Notice how the number of games using the Ocarina of Time style far outnumber the ones using the Wind Waker style. We probably will never get Wind Waker Link in a Smash Bros. game. Of course, this is all due to the fact that fans have decided that OOT’s Link is the “true” Link. Nevermind the fact that Wind Waker’s cartoonish style is much more in line with the earliest depictions of Link, and that these fans are contradicting their apparent stance for tradition. As long as they realign our views of what defines “tradition” in Zelda as being what they like the most. I will tell you right now that I prefer the look of Wind Waker Link or even the old illustrations of Link in Nintendo manuals to the guy depicted in Twilight Princess, but TP Link is the least offensive to most gamers’ fragile sense of maturity and adulthood, and so he’s going to win out. The way some fans approach Zelda these days evokes the same level of creepiness that brought about FF7 roleplay chatrooms romance fanfiction involving game characters. Nintendo needs to be able to make what they want, how they want it. No matter what they do, they are going to be looked at as being too traditional or too strange. Considering any Mario or Zelda game is going to have earnings in the black, I think it is time they threw caution to the wind and have a go with whatever they want. And what can we do about it? Plenty of things. For one, we need to stop being held back by nostalgia. College age kids all over will tell you how sweet Mariokart 64 still is, but they won’t dare touch Double Dash. Nevermind the fact that Double Dash has a stable framerate and more options, while Mariokart 64 has done everything but age gracefully. 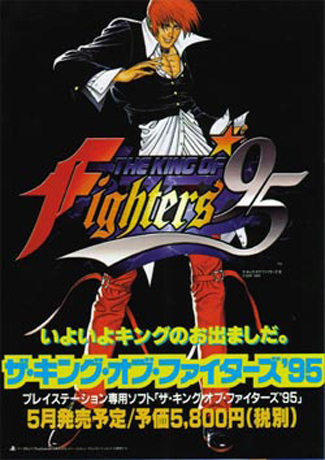 We need people to stop holding up some old games when they have clearly been surpassed. Super Mario Bros. is a game that will be playable for years. MK64 is something I claim was unplayable three years ago. In addition, there seems to be a games version of the Illuminati, a subculture that seems to be able to dictate what the mindshare opinion of older games is. Back in the day Super Mario World was clearly better than SMB3. Nowadays SMB3 is the best, and World is rarely discussed. Link the to the Past was the best Zelda, maybe, but right now the original is superior. Sonic 3 was never better than Sonic 2. And of course, we were never at war with Eurasia. We were always fighting Eastasia. I know where some of this comes from. There are luddites and pongists and elitists whose opinions change as they get older and/or more jaded. Sometimes their views get read by a random blogger or big time journalists. They make the same claims in order to keep their street cred strong. Gamers read them and parrot them some more in order to sound nonconformist. It is a trickle down effect that creates a very conformist mindshare, one where you wonder if half the comments people spout out are about games they have even played. Thanks to this situation, we have an increasing number of people who seem content to ignore the “failure” that was the Gamecube and its games while building up others that should be left to die an honorable death. I hope you all enjoy Mario Galaxy. Just make sure that when you tell me how awesome it is you know exactly why. I agree with the overall thrust of this argument. It’s interesting to think that Miyamoto is wrong to a degree because using Mario may actually pigeonhole him into certain game mechanics based on what he has seen sells and doesn’t sell. Mario does of course also matter psychologically to the player. We have such huge and specific expectations when we see Mario in a platformer or Link in an adventure game. Perhaps to keep fan uproar and accusal of betrayal to a minimum, Nintendo should put DK and Wario in more experimental platformers. Notice I don’t care if they create someone new, because it’s not about plot or characterization. As I wrote, I don’t believe those things matter in 75% of games. I do agree with you that Nintendo fans expectations matter, though. Finally, I disagree with a few of the specifics of your argument. Besides graphics and sound, what’s better about SMW compared to SMB3? They are a year apart and Miyamoto has gone on record as being disappointed about SMW. In a platformer level design is king and it’s not simply groupthink to believe one platformer could have better level design than one released slightly after it. It may not be true, but I think it’s the honest opinion of many people. If you’d like to give me a pass to believe it based on thought and still accuse others of believing it based on group think, that’s fine with me. Well, having picked up Galaxy on the release date and played it to the point of excluding the other seven squillion games I’ve bought over the last few weeks, the aspect that’s most impressive is the sheer degree of refinement – I forget who I’m stealing this talking point from, but I’d say it revises the 3d platformer format as radically and effectively as Mario 3 revised the 2-d sidescrolling platformer format (whew). I don’t think it’s revolutionary – it certainly FEELS revolutionary since the game’s wiimote controls are so elegantly implemented, but both mechanically and organizationally it’s still the same ol’ hub-world/search-out-stars/jump-on-motherfuckers/etc formula augmented with new stuff to do. Luckily, the new stuff is integrated so seamlessly and does so much to help distract from all the inherent shortcomings of the 3d-platformer format (with more than a little help from the game’s physics and level design and camera, all of which are clearly incremental evolutions from M64) that the total package feels like such a huge step forward as to make the original template essentially unneccessary. tl:dr, I know, but still. Really, the bottom line is that this game is absurdly amazing. Jay, my comments about SMW was that I remember many people believing it was a better game some time in the mid to late nineties, and then suddenly no one gave a crap about it. I don’t understand how that many people could have been swayed so easily. My limited time with Galaxy has been excellent so far. I started out underwhelmed but each time I pick it up it gets better. It’s around a 9 right now and I hope it goes to 11. Christian, I get your point. People as a group decided one game was better than another quite arbitrarily one day. I figured as long as I could explain why I prefer a game to another in terms other than nostalgia and “but everyone else thinks so” you’d give me the OK to enjoy SMB3 more than SMW. Come clean, which do you prefer? The Lost Levels are better than both! This is something I’ve felt as well for awhile now, especially after Twilight Princess came out. Nintendo should realize that it’s not always best to listen to their fans. Fans do what you suggest, and ask for experiences that mirror their nostalgic memories. But it’s foolish to think any sequel will have the exact same feeling the original had. The simple fact is that, what made the original game so special, has already been done. Asking for it again is like asking to have the same dish you had yesterday (but it becomes a lot worse with video games, as it is a mental pleasure, not really a physical one). And in some ways, Nintendo did the same thing with Galaxy that they did with TP. It’s merely a refinement of SM64, with the overworld structure, but after putting in 3-4 hours into last night, Nintendo has outdone themselves in both playability and presentation. There have been a few instances where I actually smiled and laughed at something that wasn’t immediately a joke. It was just too adorable, and it tickled my “cute” bone. TP had none of that. That game was soulless, while Galaxy is brimming with energy. This isn’t to say I disagree with your argument, as you are perfectly correct, but thankfully Nintendo has not let us down with Galaxy. The fans wanted a SM64 game (and did get one), but Nintendo went the extra mile and included so many little extra touches that it successfully replicates the feelings I had with Sm64, while at the same time giving us an all-new memory to cherish. And by the way, I prefer World way more than SMB3. It’s got Yoshi, the Feather Cape, a world that you can explore at any time you want, and some awesome graphics. And it was of the first instances where I felt accomplished when I got 96* on the Start Screen. First off, great article. I know for a fact that nostalgia often creeps into my opinions of games. That being said,I’ve played galaxy. It is pretty great, and I did get happy when I saw some nostalgic things. The game play is great while feeling new; I especially like the way the wand is used. But my favorite part so far has been the music. I like it because it is different that most of the Marios I’ve played. It is a amazing what a full orchestra can do. It sounds so very epic, yet beautiful. Kind of like space. I don’t know if my comments actually brings anything to the conversation, other than my favorite part of a tried but true series has is the music. Dan, your comments are most welcome. As I said, I was already certain Galaxy would be great, but I enjoy reading why from you and everyone else. It seems to me the game finds a smart balance between nostalgia and innovation. A few of things are in there because they know we’ll like it (see mario 3 music and airships), but it isn’t afraid to use what works. For example, I noticed that the crazy, spherical duck-like monsters from Sunshine are in Galaxy. I can already think of interesting ways in which those would work in the game, and I’m glad Nintendo kept them rather than try to bury away anything related to Sunshine. did you feel dumb when you unlocked toon link in brawl? serious question!! lol. anyways i just completed galaxy, i’m late in the game, just got a wii, and as a whole experience, it was amazing and innovative – but after beating it i feel hollow, maybe because i felt no purpose. i was shocked to see i got another star after beating the last bowser instead of catching Peach, but i did in the end, so it doesn’t matter. i think i preferred the 64 version. at least i got cake. Only to an extent Matt. I was thrilled to see Toon Link in the game, but I also get insulted by people for using. I also realized since that the Smash roster is not chosen by what western fans want, which is the reason he is in fact there.